These sprouts are irresistible! They make for a perfect side dish and also add a pop of colour to the dinner table. On a cooking sheet, toss the brussels sprouts in olive oil and season with salt and pepper. Roast the sprouts for 30 minutes, tossing occasionally. Meanwhile, melt the butter in a saute pan over medium high heat. Add the pecans and coat with the butter. Add the sugar and toss to combine for one minute. Set aside. When the sprouts have begun to crisp, drizzle the syrup on top. Shake the pan to coat the sprouts evenly. Return to the oven for 5 minutes, or until the sprouts are crispy and golden. 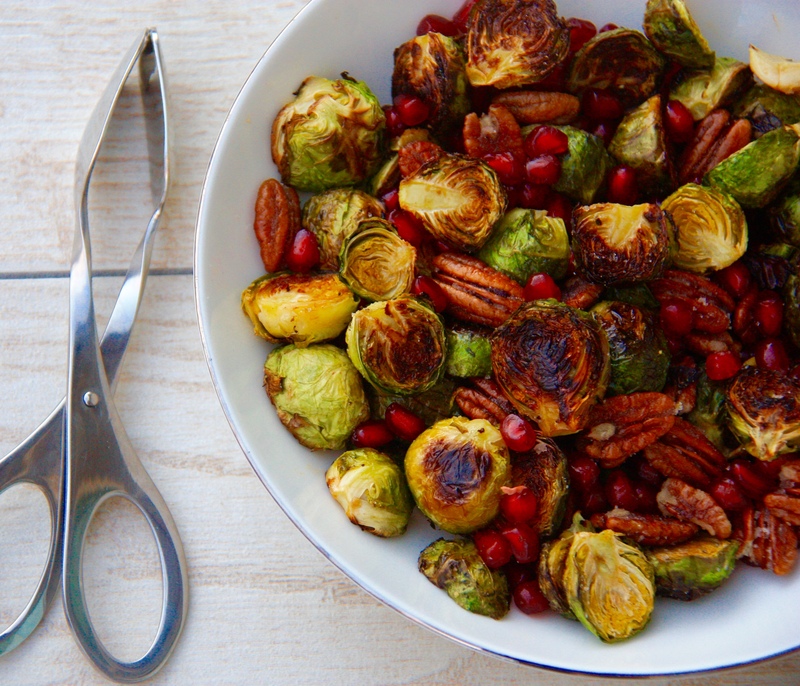 Combine the pecans, sprouts and pomegranate seeds. Serve and enjoy! Leftovers can be combined with farro, bulgar or quinoa to make a hearty lunch!